Leaders Scalby 2nds confirmed their promotion from Division Two when Scarborough 3rds conceded their game, also making sure of the latter's relegation. Ganton look odds-on to join them in Division One next season after Ali Limb's stunning 71 not out secured them a four-wicket win at home to relegation battlers Ravenscar. The hosts were grateful for a patient 41 from Freddie Barker as they made it to 128-9, losing late wickets thanks to fine bowling from Robbie Milner (4-27). Milner then hit a composed 33 to give Ganton a fine start but 4-38 by Gerald Smith put Ravenscar back in charge during a rain-interrupted second half of the match, but Limb then took the game by the scruff of the neck, hitting a succession of boundaries as he batted adeptly with the tail to take his team to victory. Second-from-bottom Wykeham 2nds are now only a point behind Ravenscar as their game at Sewerby 2nds was drawn due to rain. The visitors were in deep trouble on 49-4 chasing Sewerby's 159-5 when rain stopped play, Peter Davies (52no) and Ian Dennis (37) impressing for Sewerby and Scott Wardman taking 3-31 for Wykeham. Kirkbymoorside boosted their chances of beating the drop with a six-wicket win at Ebberston 2nds. Mark Estill was the star with bat and ball as Fylingdales won by 51 runs at Cayton 2nds. Estill smashed 90 and Barry Heyes 60 as Dales posted 180-6, Simon Glave bagging 4-40. In reply, Mark Sayers hit 33 and Jes Riley 28, but keen bowling from Estill (3-37), Alfie Husband (2-6), Heyes (2-22) and Harry Purves (2-27) pegged them back to 129-9. Seamer 3rds remain on track for the Division Three title after a 24-run win in a high-scoring contest at second-placed Pickering 3rds. Phil Metcalfe top-scored with a cracking 81 as Seamer posted an impressive 240-8, Connor Myerscough making an excellent 70, Neil Cowton taking 3-34 and James Boyes 3-55. Owen Cowton led the way with an unbeaten 69 for the Pikes in reply, Luke Shepherd adding a undefeated 55 while Neil Cowton had earlier made 40 as the hosts made 216-4, Jamie Griffin bagging 2-49. Forge Valley 3rds are still in the promotion mix and are just three points behind Pickering 3rds after their eight-wicket win at home to Scarborough Rugby Club. Sarfraz Ali took 3-5, Luke Calvert 2-11, Matthew Nettleton 2-16 and Tyler Beck 2-26 as the visitors were skittled for 58. Christian Reddish's 28 helped Valley to victory. Flixton 3rds are also still in with a shout of promotion after a rapid nine-wicket win at home to basement club Cayton 3rds, who look set for the drop. Charlie Colley's 3-23 helped Flixton send Cayton crashing to 43 all out, Tony Rudeforth's 21 guiding Flixton to victory. Muston batsman Max Truelove smashed a superb 104 as his side won by 115 runs at Snainton. Steve Pratt also struck 63 as the visitors posted 232-6, Michael Kipling taking 3-21. Kipling then struck a gritty 49 not out as his side were dismissed for 117, Kyle Orange and Darren Newland taking three wickets apiece for Muston. Flamborough won by 38 runs at home to Nawton Grange 2nds, Harry Gunning putting on a great all-round display. Gunning top-scored with 47, while Andy Dixon hit 30 and Marcos Garcia 25 not out as Boro set 155-7, G Hodgson bagging 3-22. Ben Stamp's 58 gave Grange hope but they slipped to 117 all out, Alan Stadler and Gunning taking three wickets apiece. Heslerton 2nds maintained their lead over Cloughton 2nds in Division Four after a seven-wicket win at Forge Valley 3rds. Marc Dring took 6-45 and Matty Webster 4-29 as Valley were all out for 76, Eric Hall making 35. Carl Jackson then took 2-21 for Valley, but Webster (23no) saw Heslerton to victory after fine work from veteran Ian Dade (46). Cloughton 2nds remain second after their scheduled visitors Scarborough Nomads conceded, with Ganton 2nds also having to concede their game at home to Wold Newton 2nds due to a lack of players. Ravenscar 2nds claimed their opening win of the season, easing to a six-wicket win at Scalby 3rds. Daisy Stokoe and Anthony White took 3-9 and 3-11 respectively as Ravenscar dismissed the hosts for 68, Jake Andrews' unbeaten 33 securing the win for the visitors. Ellery Liley took 5-5 and Tom Micklethwaite 4-7 as Filey 2nds won by four wickets at Muston 2nds. The home side were skittled for 63 but Filey lost six wickets making it to victory. 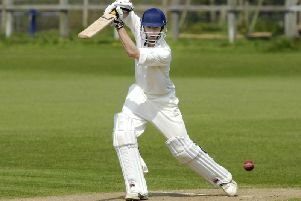 Mulgrave 2nds claimed a dramatic 15-run win in a match dominated by bowlers at Sherburn 2nds. The hosts must have felt they were in the driving seat when Mulgrave were dismissed for 63, Brian Garbutt taking 3-6 and Ashley Oldroyd 3-11, but a magnificent seven-wicket haul from Cameron Fox and 3-27 by Luke Spenceley sent Sherburn crashing to 48. Tom Snowden scaled the heights with bat and ball as Thornton Dale 2nds won by five wickets at home to Wykeham 3rds. Snowden scooped 4-28 and Harry Gargett-HIlton 3-17 as the visitors were pegged back to 99-8, then Snowden's 47 not out saw them to victory.